Recently a friend of ours wanted a traditional South Asian baby shower, so we had a Godh Bharai ceremony for her. Godh Bharai literally means showering and filling the mother-to-be’s lap with abundance, love and prayers. Here are some tips on how to plan a traditional Godh Bharai ceremony. Keep the theme traditionally South Asian and desi. You can do a truck art theme or basant or keep it colorful with dupattas and lights. Wear traditional South Asian clothes and encourage guests to take out their bright shadi clothes too! The core of the Godh Bharai are the traditional rasms around it. Pick specific rituals you are comfortable with and that will make the mother-to-be feel special! Make a special decorated seat for the mother-to-be to sit on. Sing traditional songs on dholki (keep copies of lyrics near by for everyone). Put jewelry of fresh flowers on the mother-to-be and henna on her hands while everyone sings. A traditional Godh Bharai ritual is putting fruit in the lap of the mother-to-be. Elders can do this and bless her with duas. Guests can also come up and feed methai to the mother-to-be while blessing her with duas. An elder can also lead a dua for the mother-to-be so that everyone can bless her together. What is a South Asian/Desi ceremony without the talk of food? Keep the food traditional. Women usually like spicy options such as chaat, dahi barey etc. Here are some menu ideas for a desi afternoon tea party. Godh Bharai ceremonies are usually women only. On the invite you can mention the theme so that guests dress up accordingly. Make the mother-to-be feel special and also take care of her comfort by keeping lots of cushions for where she will sit and finishing the event on time. 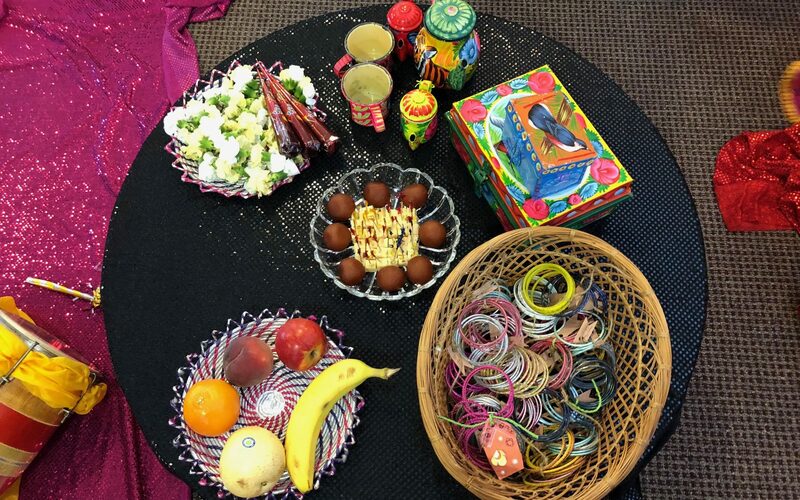 For party favours you can give guests sets of traditional bangles. A Godh Bharai ceremony is lots of fun! Have you ever attended one or plan to arrange it? Hope these tips help!